For a democratic secular Iran. For peace and prosperity in the Middle East. : Who Does Obama Invite to the White House? Who Does Obama Invite to the White House? Although the guest list to the recent White House Nowruz party is not made public, but somehow the cat got out of the bag and it was revealed that NIAC's research director, Reza Marashi and its founder, Trita Parsi were amongst the guests. 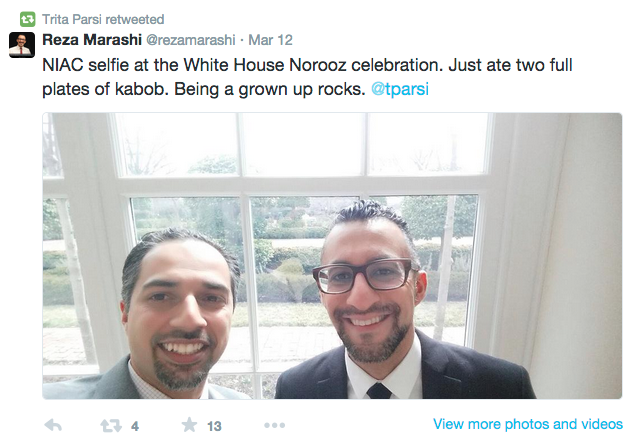 This selfie at the White House Nowruz party was taken by NIAC's founder and then tweeted by the Iran lobby organisation's research director, Reza Marashi. NIAC were behind spreading the lie that US sanctions were responsible for the medicine crisis in Iran. Even though Iran's own Health Minister at the time, who was later dismissed by Ahmadienjad, repeatedly and explicitly said that the medicine crisis was nothing to do with sanctions. It seems on Iran, Obama is also wrongly advised as to who is friend and who is foe and he cosies up to people who spread lies about his administration's policies. Well with friends like that who needs enemies?! No wonder Obama administration's foreign policy is in such a mess. Throughout the 2009 protests in Iran, the people of Iran chanted "Obama, Are you with them or are you with us?" Well it seems the answer is obvious.